Labna, Kabah, Coba, Tulum, Ek Balam and more! Witness the wonder of Mayan astronomical accuracy in the phenomena of the sunrise at the Temple of the Dolls in Dzibilchaltun and the descension of the Feathered Serpent shadow at the great pyramid of Chichen Itza. Join us for a special tour of Maya archeological sites in the Yucatan with world renowned archaeologist and guide, Alfonso Cleveland Morales. Alfonso is the Director of the Proyecto Grupo de las Cruces, an archaeological project excavating in the Cross Group of Palenque since 1997. He has a Master's degree from the Institute of Latin American Studies at the University of Texas at Austin. He has over 35 years of experience guiding at the ruins of the Yucatan, Palenque and elsewhere in the Maya World. He is an authority on the cutting edge studies of archaeo astronomy and sacred geometry in the art and architecture of the ancient Maya. He was recently featured in two History Channel programs about Palenque -- the "Lost World" series. March 19: We pick you up at any hotel in Cancun between 7:00-8:30 am (depending on hotel location). Our journey begins with a visit of Ek Balam, a recently uncovered Maya archaeological site with very distinct features. The wonderfully preserved state of the sculptures and frescos at Ek Balam are some of the most outstanding examples of the art of the ancient Maya. Some figures are winged, some in the meditative ¨lotus¨ position, one sits headless above the center of the "Witz Monster". All are beautiful and exquisitely crafted. Ek Balam's most striking temple is one with a huge ¨monster mouth". To the Maya this represents a portal to the "other world". We'll stop for lunch in colonial Valladolid, where one can experience the best in traditional Yucatecan dishes and take a little time to shop in the plaza, where authentic Mayan goods are sold. Then to colonial Merida for a walking tour. 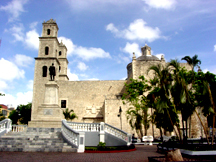 Merida is one of the most elegant and cultured colonial cities in the Maya World. Before the arrival of the Spanish, ancient Maya temples and pyramids dominated the landscape of this large city called T'ho. After the conquest the Spanish used the stones from ancient structures to build their cathedrals and government buildings. Remains of ancient Maya glyphs are visible on some of the stones. Then you have time to explore Merida on your own. It is a great place to shop for goods produced by Maya artisans: Panama hats handwoven in caves (in order to keep the sisal soft for weaving); handsome guayabera shirts; finely embroidered textiles; hammocks; ornate pottery; Cuban cigars and more. The city comes alive in the cool of the evening and on a short walk to the "Zocalo" or one of the small plazas you will see traditional Yucatecan dancers, musicians and other performers. Stroll the avenues, take a horse-drawn carriage tour of the city, enjoy the best in Maya cuisine. Or, cool down in the hotel's pool and relax. Overnight Fiesta Americana, located on the elegant Paseo de Montejo. 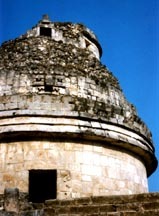 March 20: Today we witness first-hand the incredible accuracy of Mayan astronomy as it was integrated into architecture. 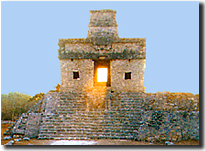 We depart early to see the Equinox sunrise in alignment with the Temple of the Seven Dolls at Dzibilchaltun. This ancient Maya city dates back to 300 B.C. and may have been one of the mother cities of the Maya. After the sunrise event we will enjoy a tour of the site. Then we travel to the elegant ruins of Uxmal. Uxmal is one of the finest examples of the Puuc Maya architectural style. Graced with two of the largest pyramids in the Yucatan and a multitude of incredibly preserved frescos paying homage to the rain god Chac and the serpent god Kukulkan, it is a site that inspires awe and mystery. Uxmal´s most famous structure, the Temple of the Magician, is an awesome feat of building prowess. This temple was rebuilt three times; this is where Uxmal got its name, which means thrice built. Towering above the surrounding jungle and crowned with intricately carved stonework, it is a treasure of the ancient world. Then we visit Labna. The corbelled arch at Labna is famous for being one of the most intricately decorated discovered in the world of the ancient Maya. Chac masks are seen on both of the arches upper corners. 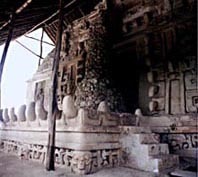 Carvings of stylized Mayan huts appear above the doorways. An interesting feature is a carving of a Vision Serpent with a human head emerging from its mouth. Overnight Fiesta Americana. 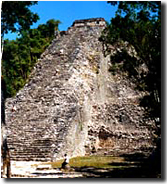 March 21: This morning we visit the ruins of Mayapan. Mayapan has a distinctive history in that it was one of the last functional cities of the ancient Maya. Modeled after the buildings of Chichen Itza it is a very well preserved mini-version of that ancient city. Then we travel to Chichen Itza. We'll have lunch at beautiful Cenote Ik Kil. Then we visit Chichen Itza, the most famous of Mayan archaeological sites and one of the "New 7 Wonders of the World". We'll enjoy an all afternoon tour of the site including El Castillo, or the grand pyramid, which has a staircase on all four sides, each with 91 steps that totaled with the last step on top equal the 365 days in a solar year. On the afternoon of the Equinox the Feathered Serpent descends in a glory of shadow and light down the great pyramid, signaling the most auspicious time to plant the essential and most revered food staple of the Maya, corn. 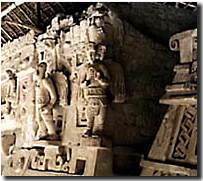 This event is one of the most dramatic displays of Mayan astronomical knowledge encoded into architecture of any Mayan site. Evening light & sound show at the ruins. Overnight at Mayaland Hotel & Bungalows across from the ruins. March 22: This morning we visit Coba, situated in a lush jungle filled with many species of animals, birds and butterflies and is a real nature lover's delight. It is home to the tallest Mayan pyramid in the Yucatan. From its top you can see above the jungle canopy for miles in each direction. On these quiet and peaceful grounds it's hard to imagine that Cobá may have once had the largest population of all ancient Mayan cities. This vast archaeological site dates from 600-900 A.D. with an estimated 100,000 people living in its domain. 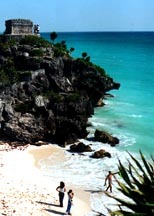 In the afternoon we visit spectacular Tulum, the most visited of Mayan archaeological sites. Perched atop a cliff overlooking the turquoise waters of the Caribbean, it is a photographer´s dream come true! Colorful iguanas bask lazily on rocks in the sun; gentle waves caress the shore. The pristine beach is so beautiful it is almost surreal. It is easy to imagine the ancient Maya landing at this bustling seaport with their canoes filled with trade goods. The Mayan ruins at Tulum have a number of interesting structures from the ancient Mayan world. Inside the Temple of the Frescoes are fantastic 13th century murals depicting ancient ceremonies. One of the few surviving images of the Mayan goddess of fertility and medicine, Ixchel, can be found here.We end our journey with drop off at any hotel in Cancun/Riviera Maya. Those going to Palenque for the March 23-28 Palenque tour extension will overnight in Cancun before taking a flight to Villahermosa the next day. For more information phone us toll free 7 days a week at 877-620-8715, or outside the U.S. (1)505-255-2279, Or e-mail us [email protected]. This tour is limited to 14 participants. The cost of this 3 night 4 day tour is $1,250 per person double occupancy. Single hotel supplement add $160. 3 nights hotel and tourist taxes (Fiesta Americana Merida, Hacienda Uxmal, Villas Arqueologicas Chichen Itza). All transportation (in a fully-insured air-conditioned mini-bus driven by a licensed chauffeur), including pick up at your hotel in Cancun and drop off at any hotel between Cancun and Tulum. The all day services of a licensed archeologist guide who will travel with you throughout the duration of the tour. Bicycle or human powered tricycle rental at Coba. Light & sound shows at Uxmal and Chichen Itza. 1 "mini" breakfast and 1 buffet lunch per person. Cold bottled water in the van as you travel. All other entry and guide fees for activities listed on the itinerary. Tour does not include air tickets or meals not mentioned above. For this tour you need to fly into and out of Cancun (unless you are doing the Palenque extension).